A multifunction printer should make your job easier--not cause you distress. A quality machine can do time-saving tasks like print to email or staple documents. But a printer on the fritz? It can stop workflow in its tracks. 1. Clean the printer heads. If your documents come out with white lines through the text or splotchy images, you might think your ink cartridges are empty, especially when using a color laser printer. In actuality, this is a common sign that your printer heads need to be cleaned. Many printers have a self-clean option. You can also manually clean them--just make sure to refer to your owner's manual. 2. Remove dust and other debris. Most manufacturers suggest using a small vacuum rather than a canned air duster to get rid of debris. Extra dust can cause jams, affect document quality, and waste toner so it’s a good idea to take the time to do some internal cleaning. 3. Keep things up-to-date. Even if you take careful care of your multifunctional printer, wear or tear over the years is inevitable. Still, a printer is an investment and there are ways to prolong its life. One way to do this is to replace worn out parts individually. For example, if your rollers are causing paper jams, it can be cheaper to just replace them from a maintenance kit instead of shelling out on a new printer. Don’t slow down your office productivity by allowing common printer problems get in the way. 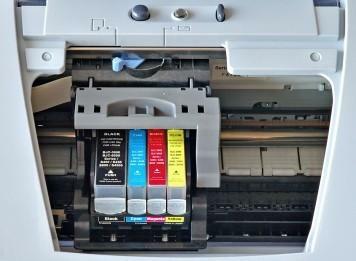 Maintaining your printer is a smart strategy to save your business time and money. Your printer's operation manual has a wealth of information proper cleaning and maintenance protocol, so be sure to keep it on hand. Pacific Office Automation offers digital copies of all manuals for your convenience. You can also contact our service department for printer repair and for more information on best printer maintenance practices.